These shades are extremely flexible, making them a good choice for windows of nonstandard shapes. The combs give this product their distinctive look but they also trap air, which makes these shades both sound and thermal insulators. Honeycomb shades can be installed vertically or horizontally, because they are lightweight. Honeycomb blinds also offer varying levels of light control. With their crisp tailored lines, honeycomb shades work well in contemporary surroundings and in windows without molding. Many people like the subtle look of honeycomb shades that blend with the wall color, but you can also create a dramatic effect by contrasting the shade color with the walls. If you want a softer treatment, choose fabric-look shades and pair them with boldly patterned draperies or an upholstered valance. Horizontal blinds’ adjustable louvers offer great light control. The more slats per foot, the less light will leak through the blinds. Blinds with cord holes at the back of the slats close more tightly, which is a feature to look for if you want to block as much light as possible. As for cleaning, some newer products have a factory-applied antistatic-electricity treatment to keep dust from building up. Horizontal blinds look great in traditional paneled or rustic-style homes as well as in modern and contemporary spaces. Roller shades have a spring-loaded roller that has been updated from the traditional design with a clutch mechanism that combines a continuous cord and pulley that allows more precise positioning of the shade without clumsy snapback. Roller shades give rooms a comfortable retro feeling reminiscent of a weekend cottage, yet with updated hardware that makes them easy to use. Most commonly used over sliding glass doors, vertical blinds are also at home with tall casement windows, fixed-glass windows or bow windows, as well as with arch-top and angular windows. Vertical blinds enhance the height of a room, which is something to keep in mind if ceilings are low in your home. Vertical blinds also allow good air circulation and are an outstanding choice when it comes to protection from UV rays. Shutters have a distinctive appearance that adds a lot of character to a room. Plantation shutters, stained or painted, are more traditional choices. Smooth white louvers, often made of vinyl, are more contemporary, especially when they’re hung in an angled- or arch-top window. 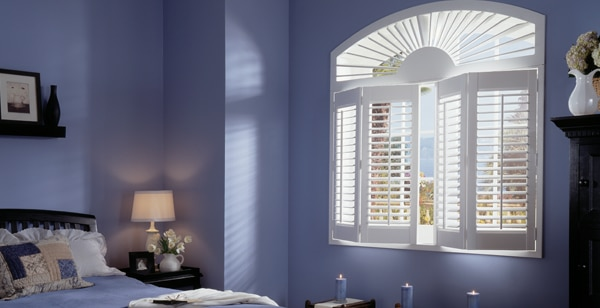 Unlike historical shutters, plantation shutters can be hung on the inside of the windows. We want to help you find a look you’ll love! We’d be happy to help you find a solution for any style of décor.